Digital Wireless Weather Station Nexus with several outdoor sensors. The weather station NEXUS offers many features. The outdoor detector which transmits the outdoor data wirelessly via transmitter (max 100mm) to the base station. Thereby, data such as outdoor temperature and humidity, rainfall, direction and speed of wind will be transmitted. In addition the client is able to measure indoor temperature and humidity in their comfort zone, absolute and relative atmospheric pressure as well as historical values from 24 hours, weather forecast and air humidity trend. The process of atmospheric pressure, temperature, and air humidity for 24 hours is graphically displayed. Furthermore, wind chill temperature and dew point will be calculated. In addition the wireless weather station offers min and max function, programmable alarm clock e. g. temperature alarm, gale warning etc., radio controlled clock with several alarm sounds and snooze functions, display of days (6 languages), time for sunrise and sunset, display of the current phase of moon, as well as a database for 3000 weather recordings. The PC interface with evaluation software makes this weather station unique. The weather station gets connected with the PC via USB interface, so the data can be transmitted. The display has a LED background illumination with light sensor. This sensor adjusts automatically the background illumination of the display. Should you require any assistance in finding a product you are looking for, do not hesitate to contact us on: UK customers +44(0) 23 809 870 30 / US customers +1-410-387-7703. 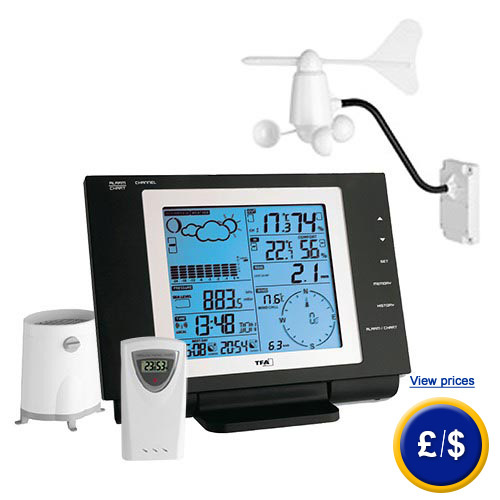 An overview of all weather stations can be also found here: weather stations. Our technicans and engineers will gladly give you advice on this wireless weather station and all other products in the field of measuring instruments, regulation and control and scales. 0 ... 99 % r. F.